It is set out in an authentic Hadith that he who fails to recognize the Imam of his age will die the death of ignorance....This direction of the Holy Prophetsa entails that every seeker after truth should continue to seek the true Imam.... The question arises: Who can be called the Imam of the age, and what are his characteristics, and in what respect is he to be preferred to other recipients of revelation and dreams and visions? The answer is that the Imam of the age is the person whose spiritual training is undertaken by God Almighty Himself Who invests his nature with such guiding light as enables him to overcome all philosophers and logicians of the world in every kind of debate. 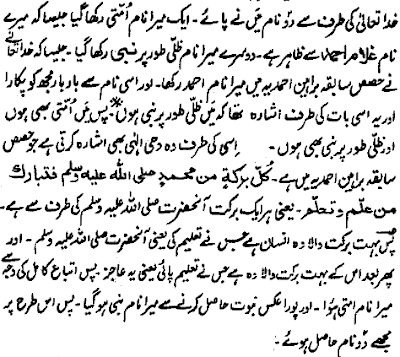 He refutes the subtlest criticism of every description so well by his God-given power, that one is compelled to admit that he has come into the world equipped with all the resources needed for its reform and thus he was not to face humiliation before any opponent He is the spiritual Commander-in-chief of the Muslim forces and God Almighty designs once again to make the faith victorious at his hand. All those who seek shelter under his banner are also equipped with the highest capacities. He is bestowed all that is needed for reform and is endowed with all knowledge that is required for repelling objections and setting forth Islamic excellences. 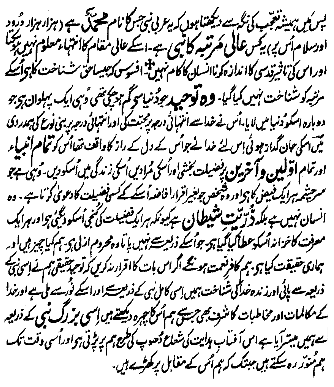 [Haqiqatul Wahi, (Qadian, Magazine Press 1907); Now published in Ruhani Khazain (London, 1984), Vol. 22, pp. 115-116]. O ye Muslims, if you believe truly in God Almighty and in His Holy Prophetsa and are awaiting Divine help, then be sure that the time of such help has arrived. This affair is not from man, nor has it been devised by man. In fact, this is the dawn which had been prophesied in Holy Scriptures from ancient times. God Almighty has remembered you at the time of your dire need. You were about to fall into the pit of ruin, but His Compassionate Hand has come to your rescue. Be grateful and jump with joy that the day of your revival has arrived. God Almighty would not permit the ruin of the garden of His faith, which was irrigated by the blood of the righteous. He does not desire that, like the religions of other people, Islam also should become a collection of ancient tales, which should exhibit no current blessing. He Himself provides light when the darkness is at its height. Do you not look for a new moon after the night of complete darkness? You comprehend fully the physical law of nature, but, alas, you are wholly unaware of the spiritual law which it resembles. That is, every blessing is from the Holy Prophetsa and blessed is he who taught—the Holy Prophetsa—and, thereafter, blessed is he who was taught myself. Therefore, through perfect obedience, I was named a follower and having acquired the full reflection of Prophethood, I was named Prophet. Thus I acquired two titles. 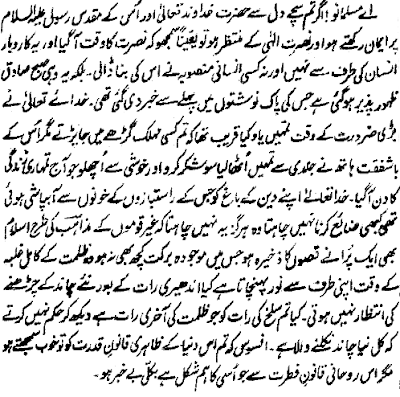 Why the promised reformer is named Messiah? 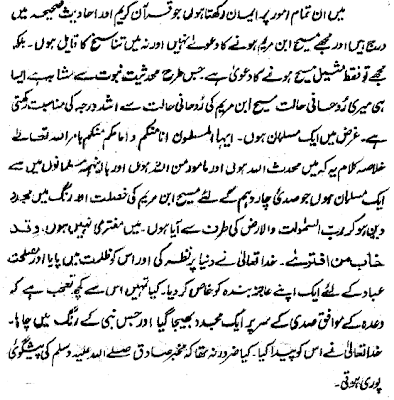 The reason for calling the Reformer of this age by the name of the Promised Messiah appears to be that his great task would be to put an end to the supremacy of Christianity and to repel the attacks of the Christians and to demolish their philosophy—which is opposed to the Holy Qur’an—with strong arguments and to convey to them fully the truth of Islam. 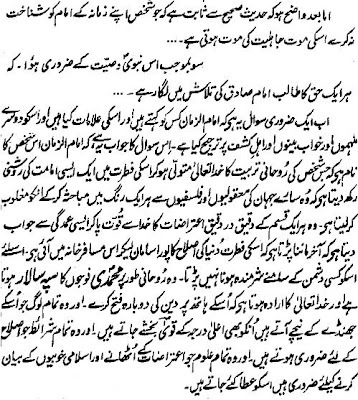 The greatest calamity for Islam in this age consists of the philosophical attacks and religious criticism by the Christians, which cannot be repelled without Divine support. It was necessary that someone should come from God Almighty to combat them. I believe in all that which is contained in the Holy Qur’an and in true Ahadith. I do not claim that I am Jesus son of Maryas nor do I believe in the transmigration of souls. I only claim that I have been sent in the likeness of Jesus. As Muhaddathiyyat resembles Prophethood, in the same way my spiritual condition very closely resembles the spiritual condition of Jesus son of Maryas, and I am truly a Muslim. In short, I am a Muhaddath from God and have been commissioned by Him. And at the same time I am a Muslim who has come in the fourteenth century as a Reformer of the faith from the Lord of the heavens and earth in the character and spirit of Jesus son of Maryas. I am not an impostor. God Almighty looked at the world and found it in darkness and singularized His humble servant for the reform of His creatures. Do you then wonder that according to the Divine promise a Reformer has been sent at the turn of the century? God created him in the image of whichever Prophet He chose. Was it not necessary that the prophecy of the Holy Prophetsa should be fulfilled? Our God is our paradise. Our highest delight is in our God for we have seen Him and have found every beauty in Him. This wealth is worth procuring though one might have to lay down one's life to procure it. This ruby is worth purchasing though one may have to lose oneself to acquire it. Oh ye, who are bereft, run to this fountain and it will satisfy you. It is the fountain of life that will save you. What shall I do, and how shall I impress the hearts with this good news, and by beating what drum shall I make the announcement that this is our God, so that people might hear? What remedy shall I apply to the ears of the people so that they should listen?